The Young Architects Prize 2012 was a competition for Dutch architects under 40 consisting of three stages of increasing scale level. 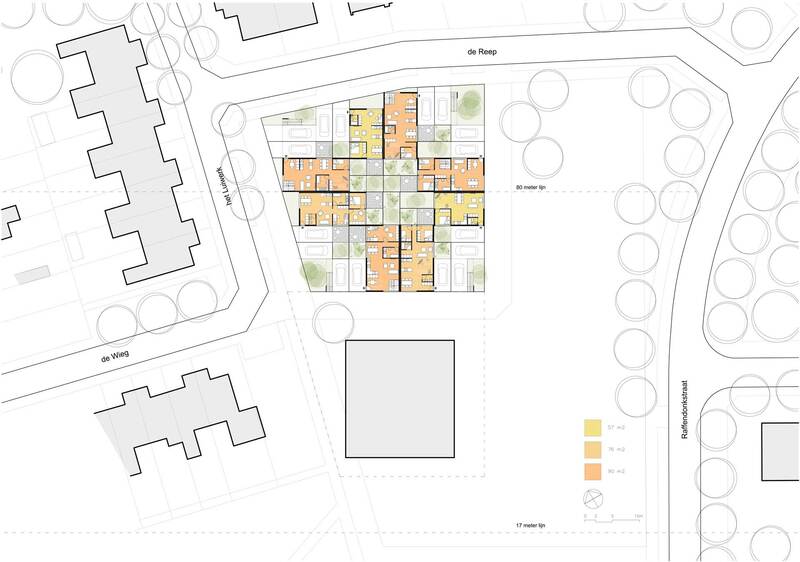 The very relevant main topic, flexible use of space, was investigated through a series of designs, starting with a home working unit, followed by housing units in an empty office building and finalised by a vision for starter homes. WithDrawingroom provides a high quality but basic working unit in which you can retreat from your living environment in order to focus on your work. The working space itself is facing a closed surface for minimal distraction. Both sides of the seating are open (the entrance door and the window), which can be completely opened, or closed with varying degrees of openness to offer privacy and concentration. 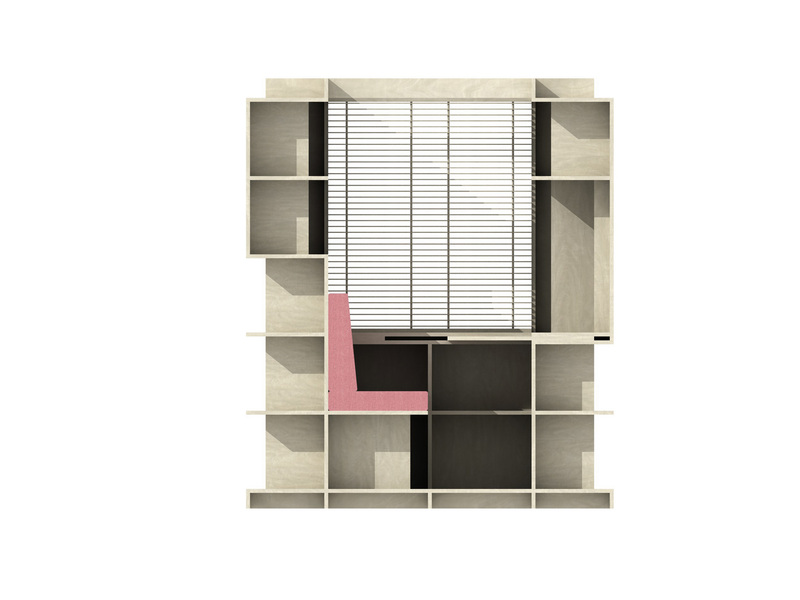 Because the windows and door open as shutters and frame the views as blinders, the working unit is in direct contact with the view to the outside and the living-area is filtered away. 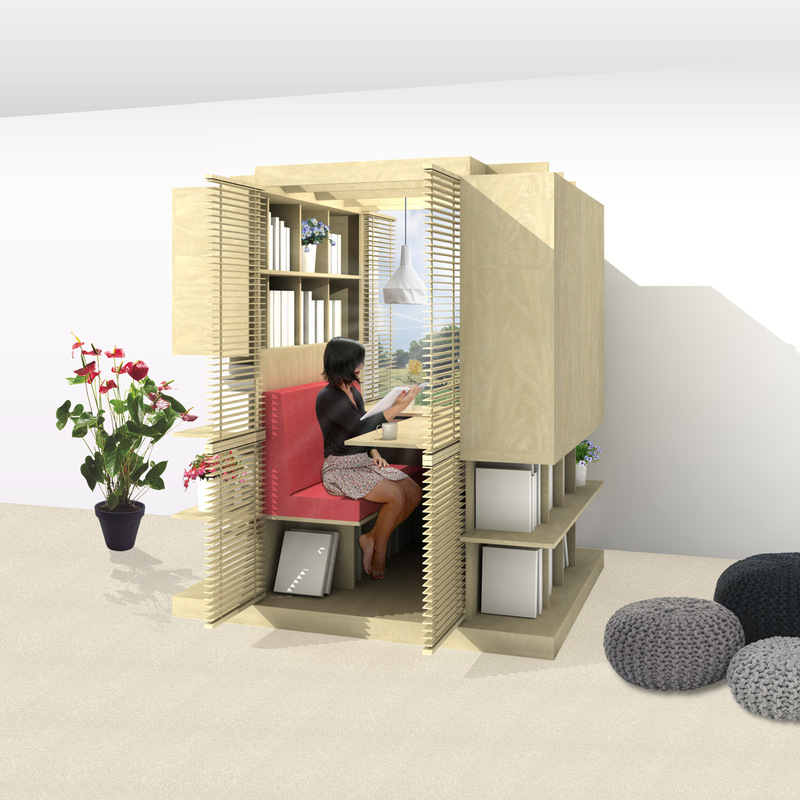 The concept of the design is to create a bookcase around the seating and the working desk. 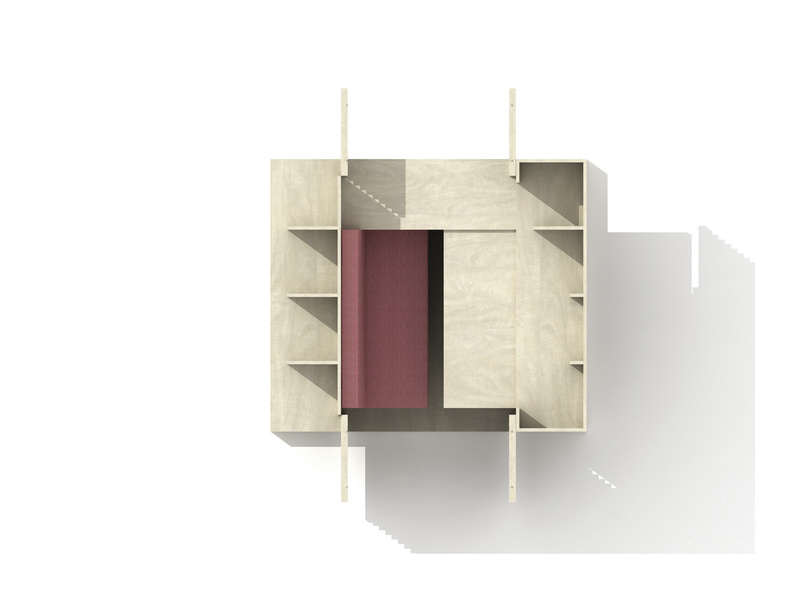 The bookcases have a distinct front- and backside and can be used from the inside for working purposes or from the outside for personal use. At night it can function as a big lamp and the closed surfaces can be used as projection screens or for hanging a flat-screen, so when you close it behind you after working hours it is still functional in the interior. Sleeping apart together examines the role of the architecture of living units that are placed in an existing office building. Such units do not have to protect from the elements but can focus purely on their second, more human goal – providing privacy and generating social interaction at the same time. 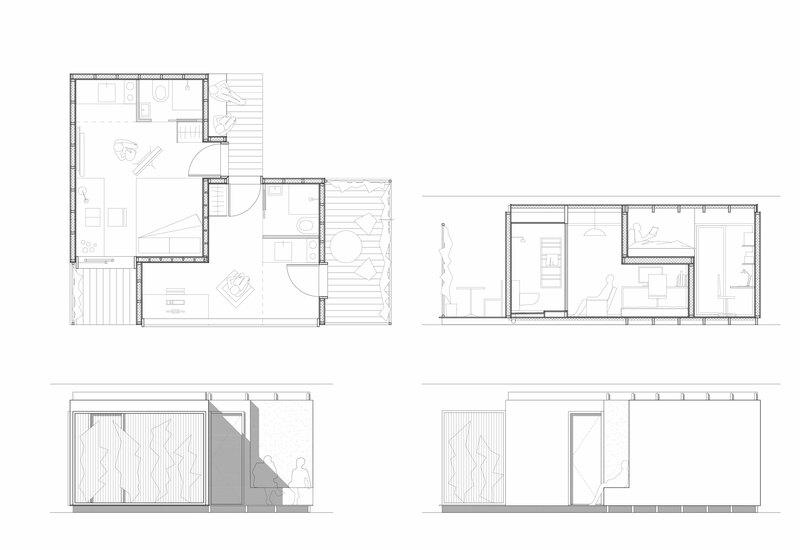 The whole office floor, including the living units and the spaces in between them, is conceived as one big landscape, in which zones of varying degrees op privacy are generated. 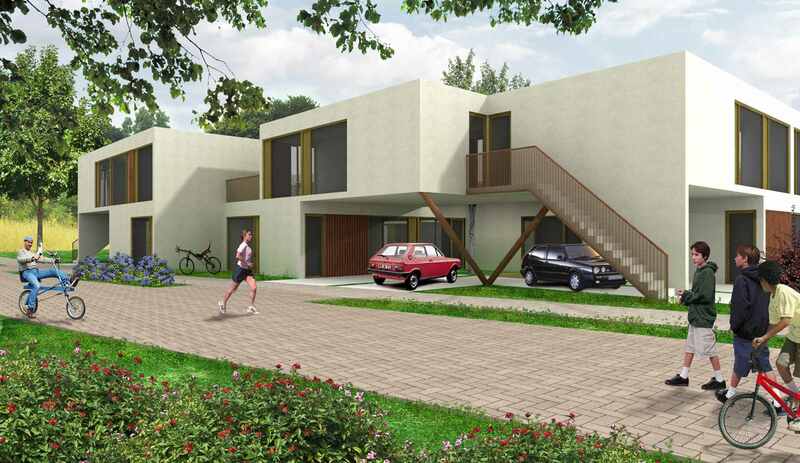 The fragmented main avenue with courts of different proportions on both sides forms the backbone of the composition as a whole, whereas the most private part of the homes, the bed, acts as the main focus of the design of the living units. Two neighbouring units are interlocked over the position of the bed, generating a low alcove bed in the first unit and a high alcove bed in the latter. This low space provides privacy and intimacy while simultaneously creating the paradox that in the most intimate part of your unit you are the closest to your neighbour, stressing the fact that these units are all about privacy instead of shelter for the outdoors. 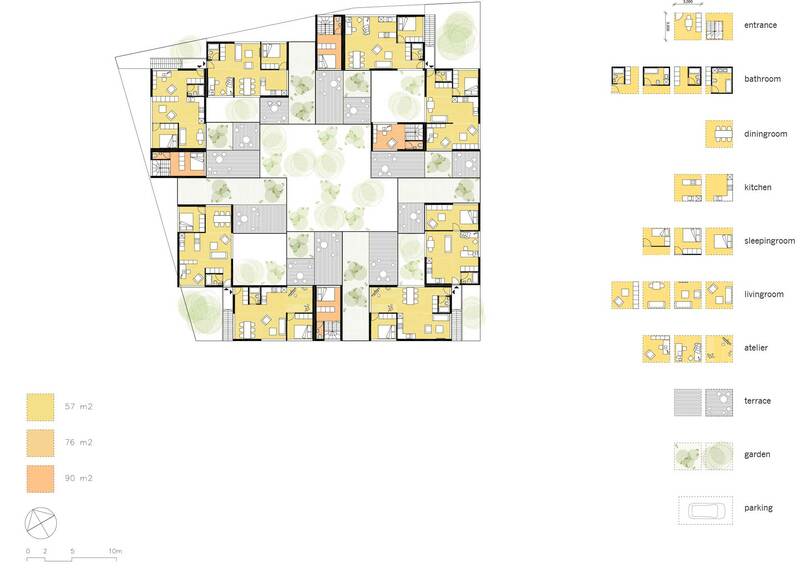 A semi-private ‘garden’ forms a buffer between the living room and the neighbour. The front doors are positioned at a semi-public front porch, where a bench that is sculpted out of the volume of the unit providing a motivation to sit down once in a while with your neighbour. The total composition with the varying courts provide in-between spaces between the main circulation and the front doors, making it possible for the inhabitants of this converted office floor to have informal meetings outside of their private unit. 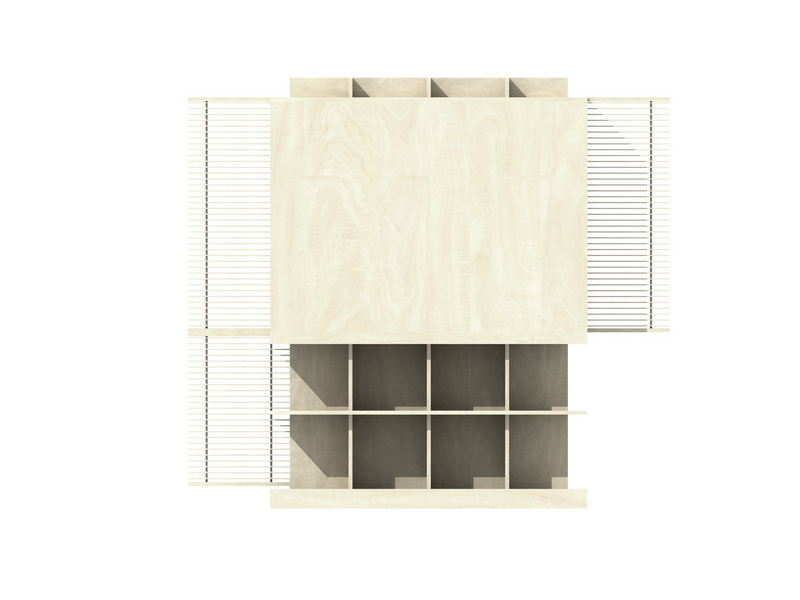 Start Up and Below investigates the possibilities of creating a porous block of single family houses that together form a single entity without repetition, the main complaint about the rigorous Dutch housing tradition. 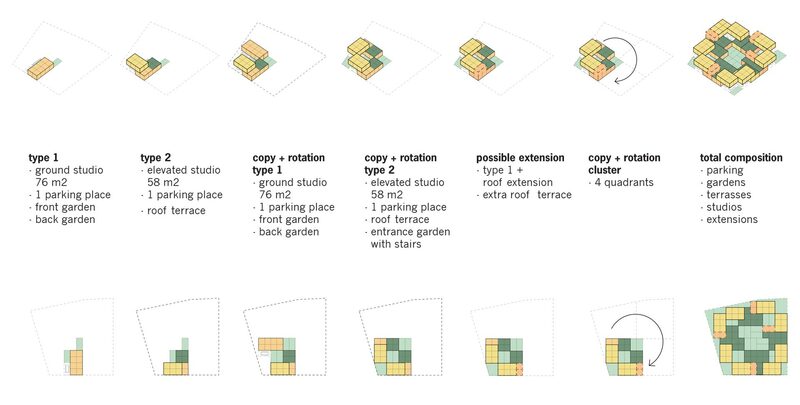 By stacking and rotating different sizes of units and by shifting the masses, an interesting three-dimensional composition gives all units a different view and orientation to the sun as well as inidividual and collective outdoor space. A 3 x 3 x 3 meter grid forms the basis for the composition. Different ‘rooms’ can be plugged into the basic building envelope. . All units have a private garden or a roof terrace and the neighbours living on top of each other share a communal front garden on street level that connects the front door downstairs with the entrance stairs going up. 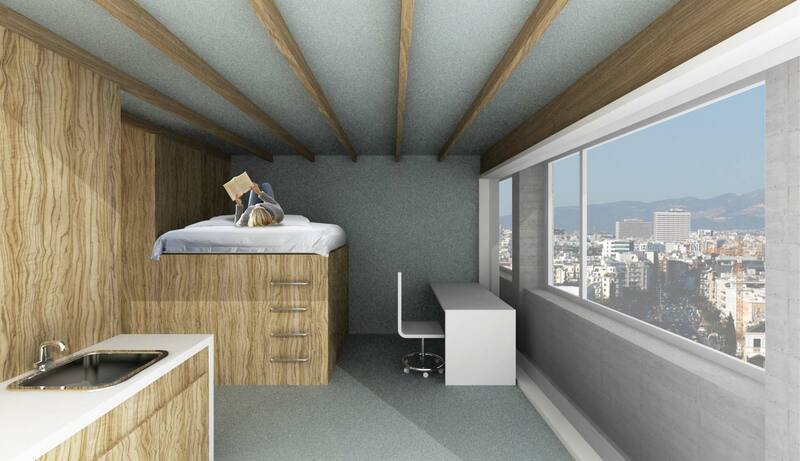 The cantilevered units provide sheltered groundspace for parking 2 cars or doing small jobs like mending your bike.